Background VAY736 is a novel, defucosylated, human IgG1 mAb targeting the receptor for B cell activating Factor of the TNF family (BAFF-R), providing both enhanced antibody-dependent cellular cytotoxicity (ADCC)-mediated depletion of B cells and blockade of BAFF:BAFF-R signaling that drives B cell differentiation, proliferation and survival. Objectives To clinically evaluate the clinical efficacy of the dual mechanisms of action of VAY736 in patients with pSS, a highly BAFF-driven, systemic autoimmune disease involving lymphocytic infiltration and progressive dysfunction of exocrine glands along with various extra-glandular manifestations. Methods A single center, randomized, parallel group, double-blind, placebo-controlled trial recruited 27 seropositive pSS patients with EULAR Sjögren's Syndrome Disease Activity Index (ESSDAI) ≥6 and residual salivary flow over a 10-month period and randomized for treatment with intravenous VAY736 at either a single high dose, (n=12), a single lower dose (n=6), or with placebo (n=9). Outcomes were measured at baseline and at weeks 6, 12 and 24. The primary outcome was change in ESSDAI at week 12. Secondary outcomes included the EULAR Sjögren's Syndrome Patient Reported Index (ESSPRI), Short Form-36 (SF-36), Multidimensional Fatigue Inventory (MFI) and global VAS assessments. Additional outcomes included salivary flow rates, Ocular Staining Score (OSS), high resolution salivary gland ultrasound (US) de Vita scores, serum markers of B cell hyperactivity and flow cytometry-determined lymphocyte subsets. Results Data analyses included all patients. VAY736 was safe and well-tolerated with no drug-related SAE, drop outs or discontinuations. Mean age was 50.5 years with 4 males, 2 in placebo and 1 in each treated arm. Baseline mean ESSDAI scores (range) were 11.5 (6–18), 14.5 (6–31) and 11.1 (6–19) in the high dose, lower dose and placebo arms, respectively. Rapid, profound depletion of circulating B cells was observed in all VAY736-treated patients. The primary endpoint of ESSDAI was reduced within 12 weeks but did not reach clinical or statistical significance. 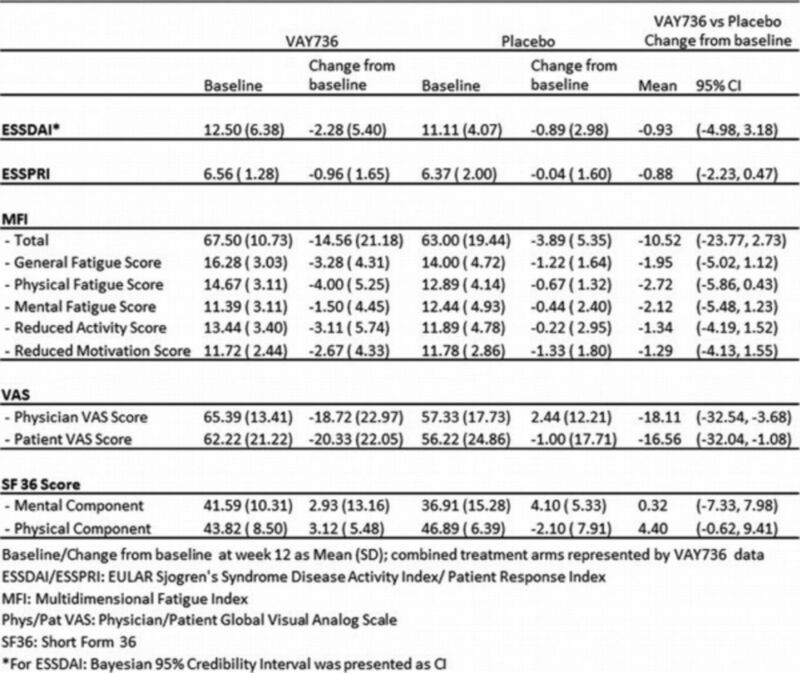 Improvements in VAY736-treated subjects were seen across the clinical secondary outcome measures, particularly for scores of patient and physician global assessments and SF-36 physical. Of note, the higher dose group had more sustained effects on clinical outcomes (e.g., ESSPRI, MFI) at weeks 6 and 12, while maximal effects in the lower dose group were more evident at the earlier week 6 time point, suggesting reduced VAY736 tissue exposure in some patients by week 12. PD measurements (serum BAFF levels, circulating B cells) confirmed target engagement. A trend in improvement of US scores occurred in the high dose group. There were no consistent changes in salivary flow rate or OSS. Analyses of additional biomarkers are pending. Conclusions Despite a limited, single infusion, VAY736 achieved in this early phase trial trends in the primary outcome and across all secondary outcomes. Thus, this treatment was safe and suggests a positive therapeutic effect for this dual mechanisms of action in pSS that warrant further evaluation.